"For, where but a moment before there had been nothing, there was now a gigantic protoplasmic mass, a colossal being who towered upward toward the stars, and whose actual physical being was in constant flux;"
"But the thing on the slab, the Dweller in Darkness, was the ultimate in horror, for from its mass of amorphous flesh there grew at will before our eyes tentacles, claws, hands, and withdrew again; the mass itself diminished and swelled effortlessly, and where its head was and its features should have been there was only a blank facelessness all the more horrible because even as we looked there rose from its blind mass a low ululation in that half-bestial, half human voice so familiar to us from the record mad in the night!" "And the thing that had gone forth and who had returned into the forest to send his minions back to us. It was he who had come from interstellar space even as Cthugha, the fire being, had come from Fomalhaut upon the utterance of the command that woke him from his eon-long sleep under that amber star, the command that Gardner, the living-dead captive of the terrible Nyarlathotep, had discovered in those fantastic travelings in space and time;"
"A black squamous growth that had begun around his foot wound and his mouth spread quickly over his limbs and torso, itching terribly and emitting a thick putrefying odour." "By the time they left for Haiti, Henley's face was darkened with scales. The ears, cheeks, forehead, and scalp were still clear, but he had the mouth of an iguana, and his eyes were ringed with black circles." "His fingers were gradually becoming webbed, and his joints rearranged so that he could move his body as could no other human." "The closer he got, the less like Henley it looked. For one, the character was too tall, way over six feet. And there was something about the way he was standing, legs akimbo, head tilted to the side like a puppet, that wasn't Henley and, very nearly, wasn't human." "When Rapf saw the man's face, he knew at once that it was Henley. They were his eyes. That was the line of his jaw. That was his hair. But that was all that was his. The skin was an oily black. Not negroid, but ink black. And the body was all wrong. Bizarrely elongated, loose as a marionette. Seeing it standing there, cool and lean its eyes bright as nails, Rapf felt his mind peel away. "On the opposite side of the nearest pool, from behind a massive shaggy tree trunk, the long man with black skin emerged. He was naked, elongated, unreal and there was a sheen on his shoulders that made them look like glass. It was a peculiar body light that addled the air around him. He glided through the grass like an apparition, his arms writhing, unjointed, undulant. Even as far off as he was, rounding the turn of the pool, it was obvious that he was not human. The flesh was crumbling off his bones like soaked bread, and the bones themselves were long and rubbery." "The shriek was white hot, and they knew it would kill them. Nyarlathotep was screaming." 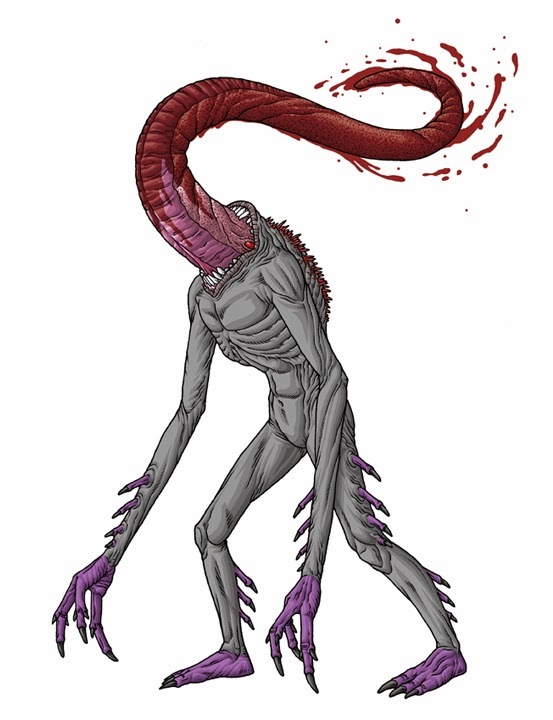 "As soon as he is assaulted, assuming he is not struck, Nyarlathotep will begin to balloon outward, his hands will turn into horrible jointed clawlike structures, and his head will swell and distort. 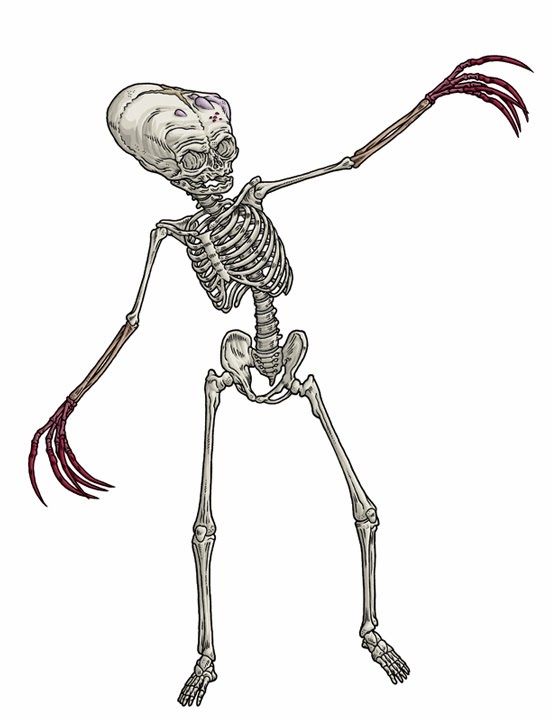 His final form will stand over twelve feet high, a skeletal horror with a wildly malformed head like the toothless skull of a human embryo." '“And while there are those,” the mad Arab had written, “who have dared to seek glimpses beyond the Veil, and to accept HIM as a Guide, they would have been more prudent had they avoided commerce with HIM; for it is written in the Book of Thoth how terrific is the price of a single glimpse." "However, the old worship continued-in secret during the times of enlightened Pharaohs and priests; more openly during corrupt and evil times. 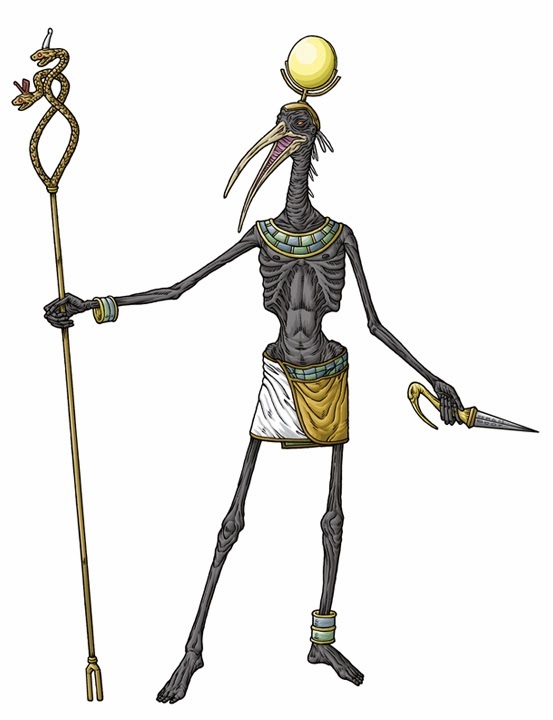 One of the centers of the old evil ways was at ancient Khemennu, where, in the form of Thoth worship, Nyarlathotep's cultists managed to dominate the region for centuries. The cultists which the investigators now oppose are the spiritual descendents of the original folk who once worshiped Thoth/Nyarlathotep thousands of years ago in the ancient temples of Khemennu." "Thoth himself was supposed to have written with his own hand a book of magic and the forty-two volume which contained all the wisdom of the world." "Against the east wall (the facing wall as you descend the stairs) is a four foot-high statue of crudely carved black stone, a derofmed dwarf-like figure with four eyes. 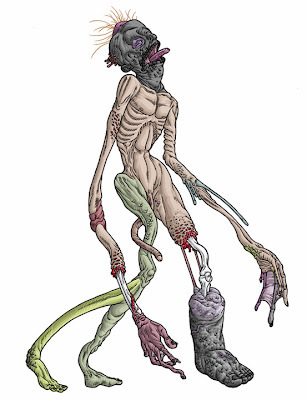 Three large tentacle-like appendages take the place of feet. 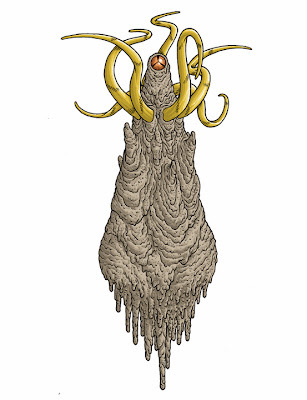 The statue represents another of the thousand aspects of Nyarlathotep, a form known in India as the Small Crawler." "And then shall the gate be opened, as the sun is blotted out. Thus the Small Crawler will awaken those who dwell beyond and bring them. The sea shall swallow them and spit them up and the leopard shall eat of the flesh of Rudraprayag in the Spring." "This particularly disgusting form of Nyarlathotep is known on Earth only among the Order of the Bloated Woman, which is centered in Shanghai." 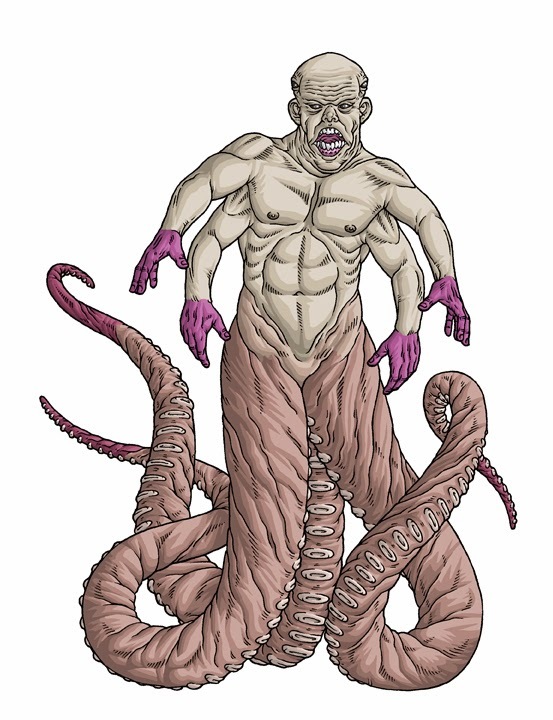 "She appears as a 600-pound, seven-foot-tall female horror with tentacles in place of arms, and more tentacles sprouting from rolls of sickly yellow-gray flesh. Below her eyes another tentacle waves, and below and beside that are lumpy chins, each sporting a mouth, each mouth a perfect rosy bow made hideous by clusters of fangs." "She crudely resembles a human woman. Multiple smaller tentacles sprout from the rest of her body. Six sickles hand in the belt of her tunic. Also in her belt is the magic black fan which, when held just under her eyes, permits her to take on the appearance of beautiful Chinese maiden." "They themselves were worshippers of the relatively insignificant deity Lrogg, which conferred benefits on its worshippers and demanded only annual sacrifice, in the shape of the removal of the legs of a conscious native." "This double revelation came when a particularly fervent group of native Azathoth-worshippers violated a temple, smashing all the statues of the two-headed bat-deity Lrogg and killing three of the priests. 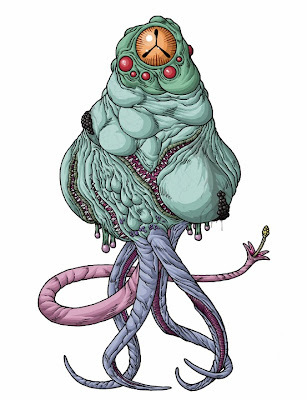 After acid had been poured into the brains of the offenders, the chief priests of Lrogg declared that the temple of Azathoth must be removed altogether from the planet, together with its insect-worshippers, although the insects who would conform to the planetary religion might remain if they wished. The cuboid natives who had become believers in the creed of Azathoth were all treated in the same way as the original offenders, as an example." "This avatar of Nyarlathotep is closely connected to the Haunter Of the Dark. 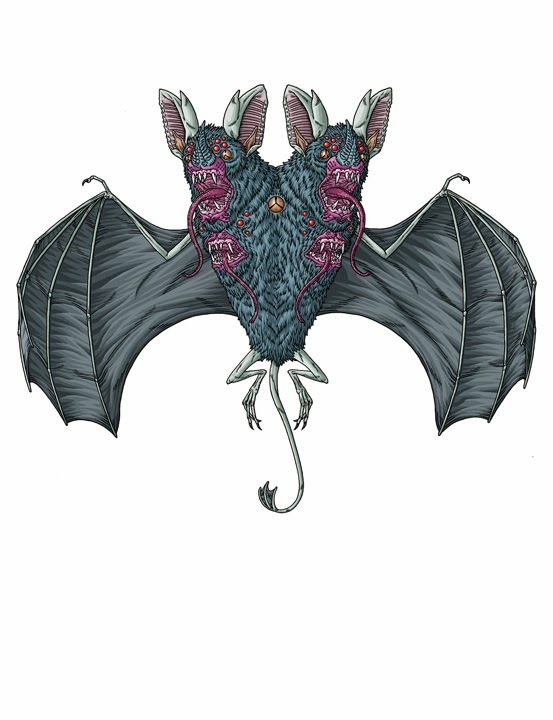 Lrogg is a double-headed bat creature composed of living, icy blackness. The bat-god has countless star-like eyes that twinkle and move about on its two faces, and each head has several fanged mouths." "The body was peeling away, cracking open like a pod, droozing a quivering cheezy bladder-the delirious, gelatious body of Nyarlathotep." shiny curdled clods of milk, thick clusters of eggs." "Rapf couldn't take his eyes off the thing. It was hovering a few meters off the ground, its jelly sac bloated with webs of blue-pulsing veins. Tendrils, lion-red, flayed open around mouthlike gaping seams that writhed below the bulbed body. The tentacles were pushing it off, in o the air, and it was lifting, its hideous rippled hulk was raising up over the puddling mess of its cocoon. " "To satisfy the god, the cult abducts villagers and sacrifices them. Then the god appears in all his terrible glory. He is nearly as tall as the mountain itself. He has no face; only a blood-red tongue hangs down from where the top of his head would be. The mere sight of this hideous god can drive men mad." "Their god isn't new, it isn't new at all. Back when the world was fresh and steaming and the reptiles flew above the swamps, it wasn't new either. The Bakongo name for it is Ahtu. 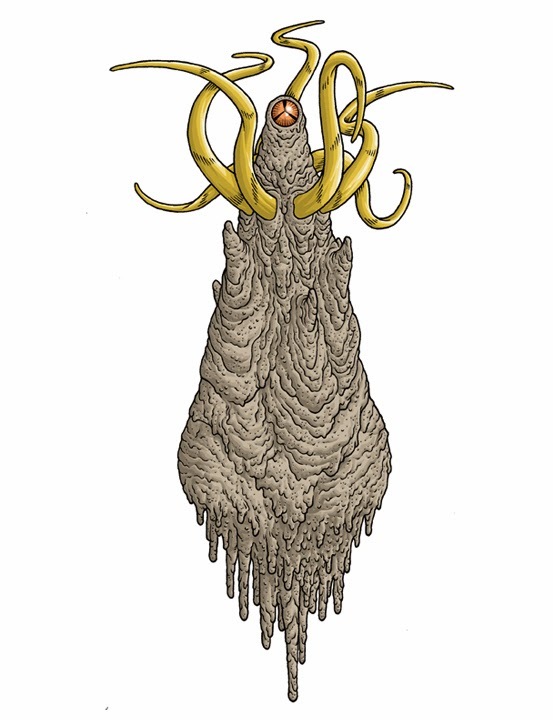 Alhazred called it Nyarlathotep when he wrote twelve hundred years ago." "Pulsing, rising, higher already than the giants of the forest ringing it, the fifty-foot-thick column of what had been earth dominated the night. A spear of false lightning jabbed and glanced off, freezing the chaos below for the eyes of any watchers. From the base of the main neck had sprouted a ring of tendrils, ruddy and golden and glittering over all with inclusions of quartz. They snaked among the combatants as flexible as silk; when they closed, they ground together like millstones and spattered blood a dozen yards up the sides of the central column. The tendrils made no distinction between Forest Guards and the others who had danced for Ahtu." "The black column that was Ahtu twisted hugely, a cobra pinned to a bonfire. There was no heat, but the light itself seared the eyes and made bare flesh crawl." "Hei! Aa-shanta ’nygh! You are off! Send back earth’s gods to their haunts on unknown Kadath, and pray to all space that you may never meet me in my thousand other forms. 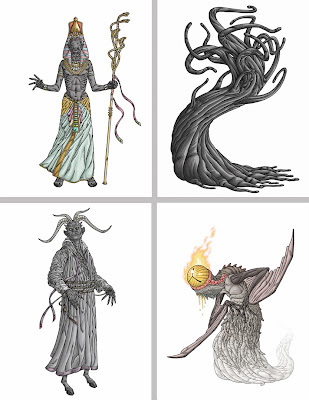 Farewell, Randolph Carter, and beware; for I am Nyarlathotep, the Crawling Chaos"
STARTING TOMORROW and continuing for two weeks, Yog-Blogsoth will feature 10 different forms of Nyarlathotep! ALL leading up to a terrifying collaboration with Jason McKittrick!!! Hey folks, as my first post of 2014 I wanted to take a minute to thank everyone that made last year so awesome! All the regular "subscribers" who buy every Volume, all the people that bought the Collection, all the folks that just purchase one Volume or even a patch or sticker, you're all awesome and make doing this worthwhile. I also want to thank everyone that's shared my work on Tumblr or Instagram or shared my Etsy store. I'll keep making monsters as long as you keep liking them! Speaking of which, my Etsy store is up and running and you can grab the VERY LAST COPIES OF VOLUME III as well as a handful of stuff like prints, posters, patches and stickers. These individual Volumes WILL NEVER BE REPRINTED AGAIN! Volumes I, II & IV have sold out! There are ONLY 3 copies of the regular version of Volume III and 2 copies of the Providence Edition of Volume III left. 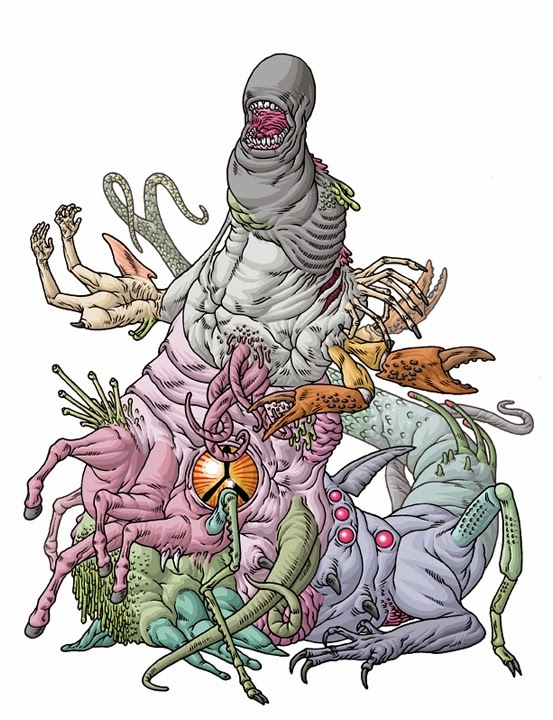 As far as monster news, I wanted to let everyone know that my first monster post of 2014 will be on Monday, January 13th. It will be a full week of monsters and not just any monsters. It's a FULL WEEK OF NYARLATHOTEP!!!! From more well known avatars to some really, really weird, obscure ones! I'm also working with Jason McKittrick on a super secret project that may or may not have something to do with Collection II! I'm also working on getting Volume VII & VIII ready for print!! Enjoy the new year!! !